The ability to share an internet connection from mobile to other personal device for free is the most beneficial feature that you can think about. However, due to its importance, carriers charge extra for this premium feature on top of their current plan. in this respect, there are several alternatives iPhone owners can use in order to make their iPhone a personal hotspot. However, some of them require a jailbroken device. If you do not want to jailbreak your device, you still have the possibility to enable Wi-Fi tethering on iPhone using the iBackupBot tool. The following step-by-step guide will present the process of enabling personal tethering on iPhone using iBackupBot without having to jailbreak the device. 1. Download and install iBackupBot tool for the operating system you are using on your desktop computer. The software is available for free, and it allows users to view, export and edit backed up files on iTunes. 2. Launch iTunes on your computer and connect your iPhone using the Lightning cable or the USB cable. 3. Select the connected device, and click on the left tree window in order to create a backup copy. From the main iTunes interface, select the Back Up Now option. 4. At this time, you need to launch iBackupBot. In case the software is facing various errors when launched, just skip past them by selecting ignore or continue. 5. From the list of all backups found within iTunes, select the latest one you have created and click on the “+” button next to the backup. At this point, a new set of options will appear. 6. Go to System Files, System Preferences Domain, System Configuration and then, right click on the file called preferences.plist. Click on the Open with Built-In Editor option. 7. Within the opened file, you need to look for the right APN. Search down for the APN associated to the carrier of your device. If you do not know it, perform a quick Google search. Erase the lines of code in the tethering APN field. 8. Now, you need to manually change the data that your device is using to access the web through cellular data. Usually, the data displays the name of the carrier. 9. Once you end the process, save the file and exit out of the iBackupBot app. 10. Return to iTunes and select your device from the list. 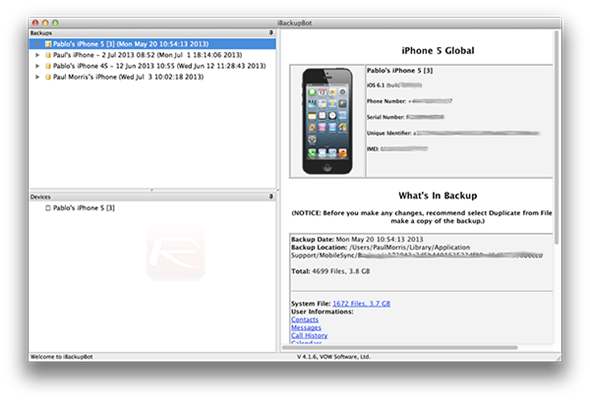 Choose Restore from Backup while holding the Option/Shift key down. It is worth mentioning the fact that you need to select the backup that refers to the one you edited using iBackupBot. At this point, Wi-Fi tethering should be enabled on your iOS device. As you can see, there is no need for jailbreaking your device, and the whole process is free of charge. 1 Respones to "Enable Wi-Fi Tethering on iPhone with iBackupBot Tool"
You need to manually modification information that your device is exploitation to access the online through cellular data. Usually, the information displays the name of the carrier Payroll management software.